My working day begins in the dead of night. While much of London turns to sleep, Smithfield stirs into life. By 10pm (9pm on Sundays) the deliveries begin to arrive in lorries the size of small barns, which queue up at the lock-ons, waiting for their cargo to be unloaded. This is as slick an operation as you can imagine with pitchers and staff from each of the traders ready and waiting to hook up their carcass orders and take them through to their designated stores. There, the cutting and processing staff are waiting to begin work, so that by the time I arrive on the scene – anytime between one and one-thirty, the place is a hive of activity. The cutters are already at work on the orders taken earlier that day, while I go to check any later orders from the office upstairs, where they will have come in via fax, email or telephone. Sales staff on the floor are already selling by then and taking orders from early customers, many of whom have arrived straight from their restaurants, which have just closed for the night. 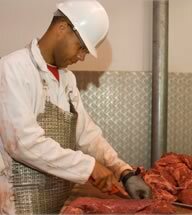 Other clients are there to see what’s available for the next night’s business or to collect pre-ordered meats. 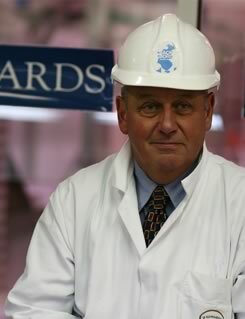 The big catering butchers are also among the early birds. These are the businesses who supply all the major restaurants, hotels and clubs and have a full night of deliveries ahead of them. The market is at its height between two and six am with everyone down on the floor selling – while at the same time upstairs, orders are still arriving for the following night, electronically. And it’s not just the trade who are buying throughout the night – we get members of the public coming through at all times, although the majority arrive after six. However to see the market’s great relationship with the general public, you need to be there in the week running up to Christmas. The last three days before the holiday, most of the trade have done their business, most of the parties and celebration dinners have been held, and so it’s just the public buying their Christmas feasts. It’s fantastic, if slightly manic. It is a great feeling though, to see the market at work. Even regulars stop to admire the cutters who are incredibly skilled. Their precision in cutting meat is awesome, because they know how even the slightest mishap can ruin a carcass…and that in turn costs money. 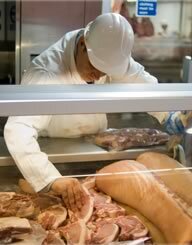 Most of us traders know through a mix of experience and guesswork exactly how much meat we will need for a night’s business…and know that what is in the shop at the start of the night will be gone by morning. And although we are all highly competitive, we have a great camaraderie – but then many of us have been here for a long time, some even for generations. It is interesting sometimes to reflect how business has changed over the last three decades. We are as competitive and as efficient as ever, much has been automated and the safety and hygiene laws are much more stringent. The market was completely modernised and upgraded in the 1990s to comply with EC regulations which included many amendments such as the new sealed loading bays, automatic moving hooklines as well as chiller rooms. Even the way we do business not to mention our working hours has changed. Twenty odd years ago I wouldn’t start work until five, and then would go to breakfast with colleagues or customers, at one of the local pubs around nine. After which it would be back to the floor for more selling and I wouldn’t really hit the office until lunchtime. Now by lunchtime it’s almost all over. Selling mostly finishes around seven, although a few of us will carry on until about 10…and the last couple of hours are spent in the office collating and collecting orders. So when most London workers are only half way through their day…I’m on my way home, hopefully satisfied with another successful day’s business at London’s oldest trading market.